Coinciding with the OZRI/APUC Conference, RIA Mobile GIS are planning to run a Using ArcPad Training Course on the Gold Coast on Wednesday 3rd March. We have uploaded a new ArcGIS Toolbox to ArcScripts for you to use. The first tool in this toolbox is an import tool to convert your QuickProject to a Geodatabase (gdb or mdb). 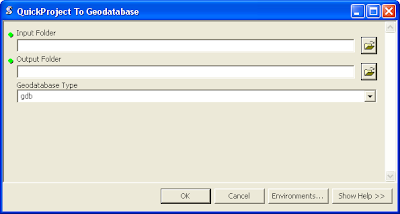 This tool will not only convert the QuickProject shapefiles to a geodatabase but it will also convert the "Categories" drop down values and convert them to geodatabase domains then connect the domains to new featureclasses. So now you can start with an ad-hoc project and automatically convert it to a geodatabase in a few clicks within ArcCatalog. We would love to get your feedback on the appropriateness of the tool for you. "Are there enough parameters for you to work with? Or are too many?"